Natural fruit juices and low fat smoothies have healing properties that can help to improve your health and can help you heal faster when you get sick. They are also a form of preventative medicine. They are easy to make and allow you to get as creative as you want with the ingredients. If eating a nutritionally balanced diet sometimes seems like too much effort then smoothies and natural fruit juices can offer a low fat means of staying healthy and strong. 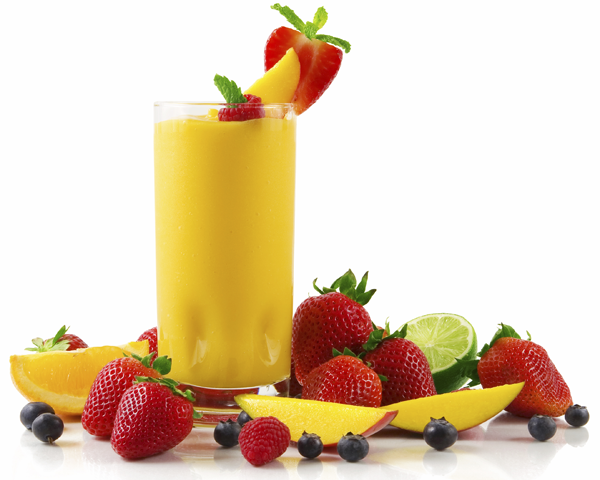 Low fat smoothies can easily be made a regular aspect of your healthy diet plan. There are so many good points connected to making low fat healthy smoothies at home in your blender. Why should you say yes to low fat smoothies? 1 Smoothies can ramp up your immune system, making it strong, healthy and resilient. When you indulge in fruit or vegetable smoothies they provide your body with a high level of nutrients, amino acids and enzymes that the body can digest easier than food. 2 Smoothies that are low in fat provide you with the nutrition you need in a rapid fashion. The reason for this is because the body is readily able to absorb the nutrients. Beverages are easier on the body than are whole foods. 3 When you drink a beverage that contains caffeine and sugar, such as coffee you get a quick burst of energy but it is not sustained over a long period of time. Low fat smoothies on the other hand do provide energy but not the quick kind. You will not crash and burn when you drink a smoothie. Your energy will continue to remain high for many hours. This will enhance your mental and physical performance and make doing all of your daily activities easier to go about. 4 Drinking low fat smoothies can fill you up easily, because of the high volume of water. 5 Smoothies are simple to make and prepare. All you need is a blender and all of the right ingredients and you can whip up a delicious healthy beverage. 6 Low fat smoothies are instrumental in correcting the body’s acidity or alkalinity balance. 7 Drinking low fat smoothies is an excellent way to ensure that you get an adequate amount of water per day. If you do not enjoy drinking water or simply do not find yourself consuming enough per day than smoothies can remedy this problem. 8 You can pick and choose the ingredients you put into your smoothies. You can get as experimental as you want to get. Low fat fruits and vegetable smoothies can even be made by vegetarians and vegans. ← Seven affordable, nutrient-dense foods to stockpile for survival.